People don’t have time for extra things to do, we are all busy as it is. But many of us would still like to have pretty bullet journals. 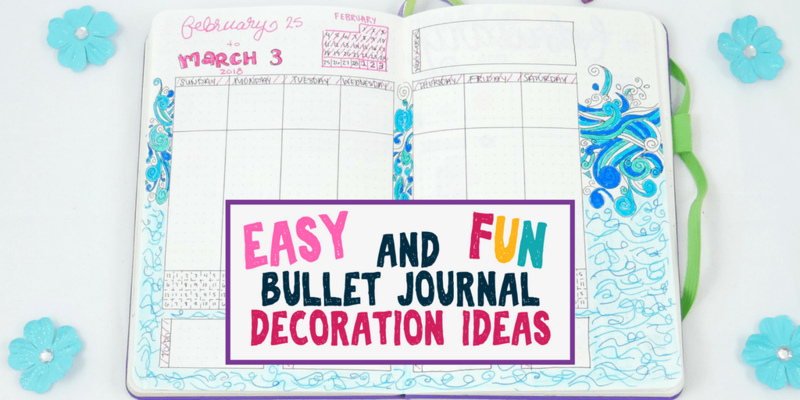 Thankfully, there are a ton of excellent bullet journal decoration options that add beauty and function while saving you time by not having to make every portion yourself. 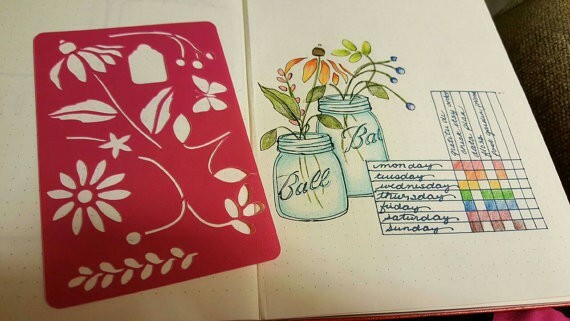 Something surprising that I’ve learned is that a lot of really talented bullet journal artists often use methods to decorate their bullet journals that are way simpler than we would be lead to believe. I’ll see a beautiful spread and what appears (to me) to be a beautiful drawing… only for the owner of the bullet journal to tell me it’s a STICKER! Seriously. You would never guess! Actually, decorating can be both practical and fun!!! And as I mentioned above, it doesn’t have to be complicated at all and you certainly don’t have to try every method. 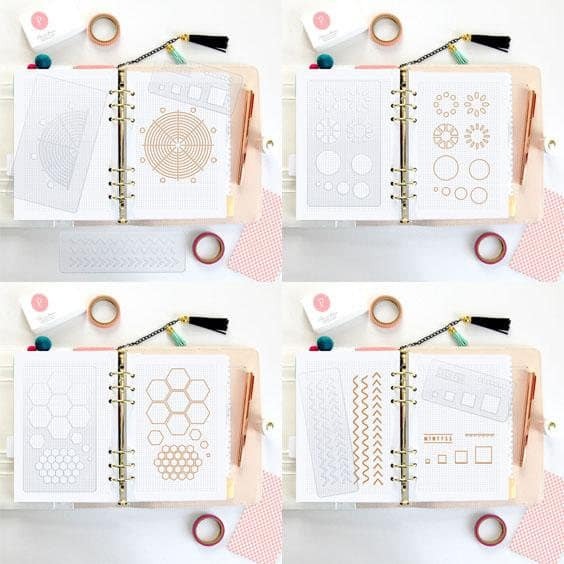 If you prefer to maintain a minimalist style, there are a plethora of bullet journal decoration options that will allow you to maintain that style. 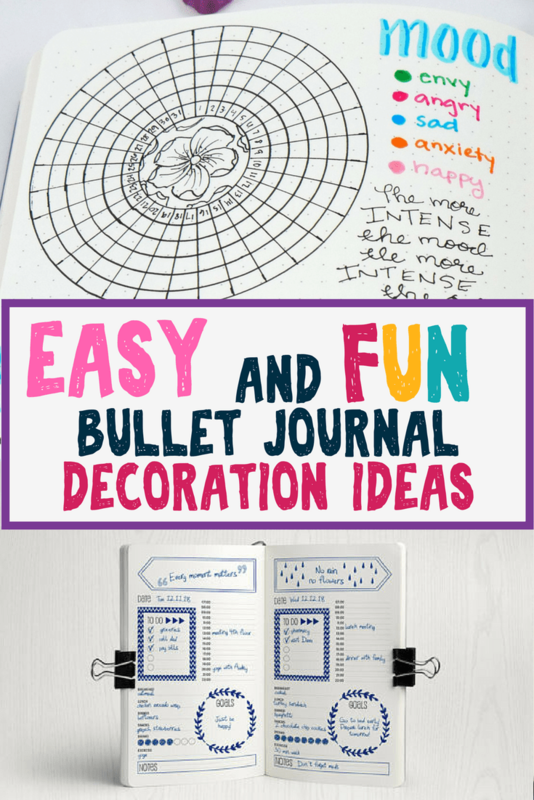 If you like fun, funky, and different, you have just as many bullet journal decoration choices that will suit your needs as well. Or, you can create an even mix of both types of options! Regardless, if it helps you create your bullet journal spreads even faster, that is truly a benefit enough. 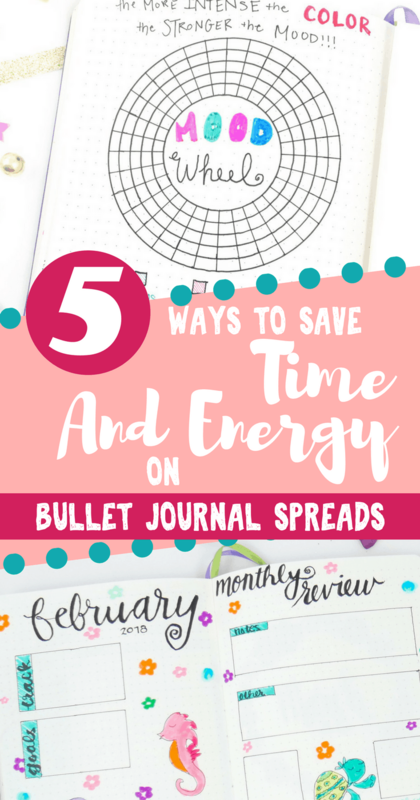 There a TON of fantastic ways to decorate your bullet journal that help save you time and energy. Some ideas help you be more efficient in your decoration efforts, and others simplify efforts entirely. 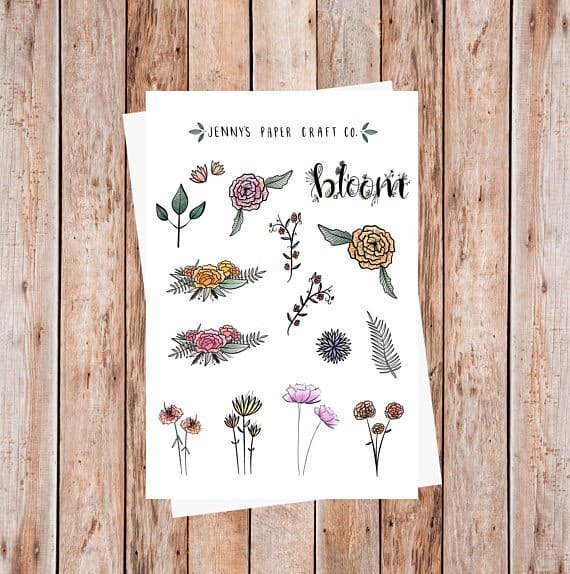 Stickers are perfect for that person who loves a lot of pizazz in their bullet journals but doesn’t have the time (or maybe even the talent) to draw everything out themselves. Additionally, stickers are also perfect for the person who doesn’t want to draw the same thing over and over again. Serious time saver, right? And yes, I know that was obvious. But it’s THAT easy. I’ve been taking advantage of them a lot in my bullet journals recently. You can find all types of stickers in stores and online. A quick search for stickers on Etsy and I’d be very surprised if you couldn’t find what you are looking for. There are thousands of sticker shops with amazing ideas and funky concepts. Stickers can actually be very practical! There are a ton of stickers that aid in productivity, tracking, and simplifying your layouts. 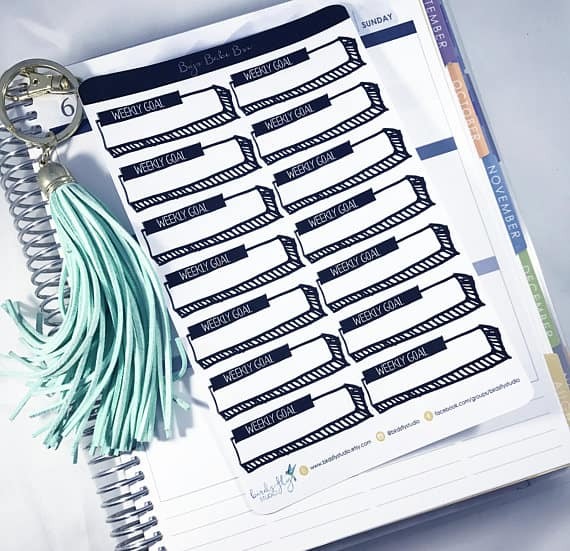 Here are some amazing examples of useful stickers to include in your bullet journal. 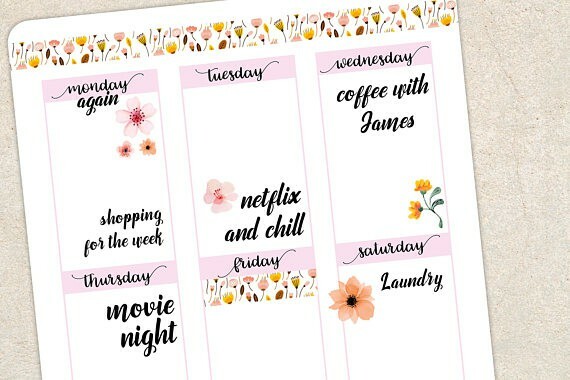 These cute weekly goal stickers have cute little boxes that provide a little adornment for a practical sticker option. I love hydration stickers! I’ve been using them in my new exercise bullet journal to help with tracking my water consumption. 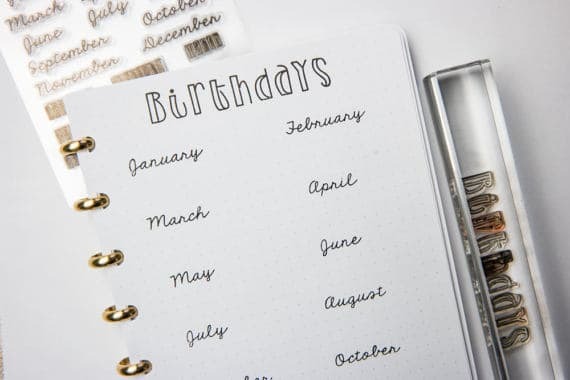 I just ordered this birthday and special event tracker and I cannot wait to use it in my next bullet journal! If you already have 2018 done in your bullet journal, prepare ahead and get stickers for next year. Most stickers exist for fun, and they’ve always been geared in that direction. One great thing about fun stickers is that you can pretty much find anything you want in some way, shape, or form. These stickers are the flowers from this image. 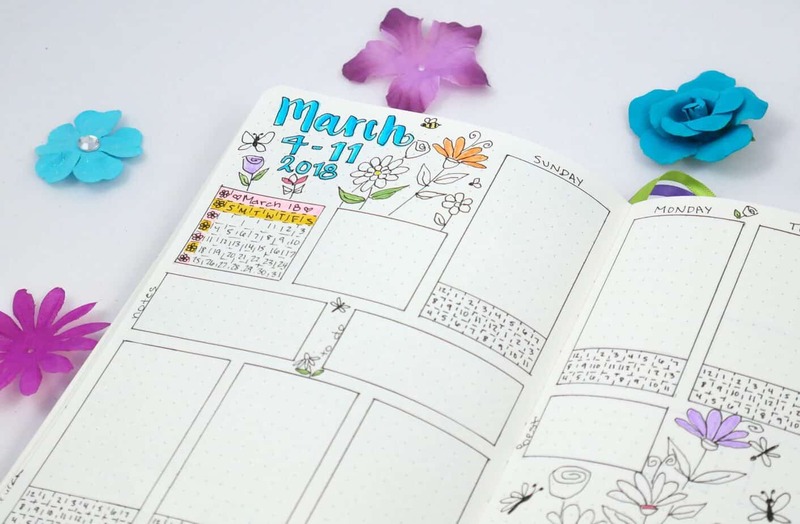 This spread shows some amazing ways to decorate a bullet journal spread and add some simple beauty. 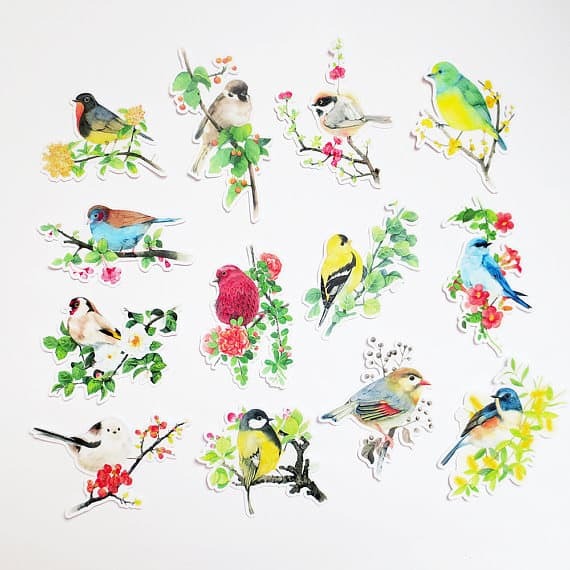 Bird stickers are a great choice for an animal bullet journal monthly theme! 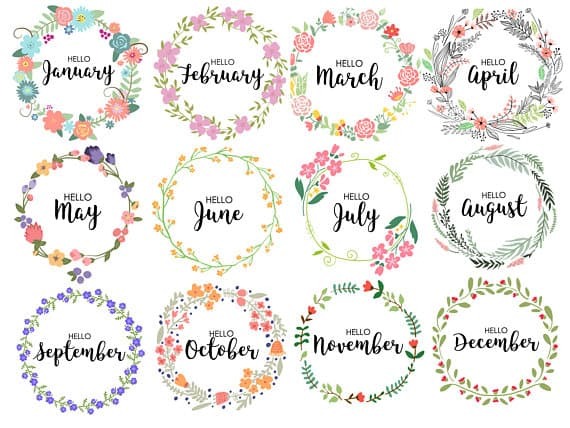 Lovely floral stickers that would adorn any bujo spread. If you are anything like me though, it’s easy to get plainly overwhelmed with all of the options exist. If you want to buy stickers but leave Etsy feeling frustrated and unable to decide, you could consider trying a sticker subscription service! Often sticker subscription packages include many different types of stickers, but it takes the work out of choosing which stickers to buy. Somebody else does it all for you! My favorite subscription service right now is the Pipsticks Sticker Subscription Packages. 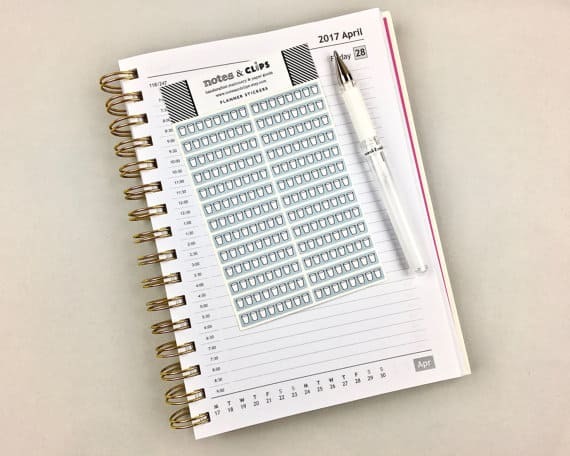 It’s a great, low-cost option that gets you many varieties of stickers to decorate your bullet journals. They offer subscription packages for kids and adults, and also offer two different size options for each group. They even ship worldwide!!! As a member of their subscription pack, you get 5% off of any other products in their shop. If you love one of the sticker packs they send in a subscription, you can buy more from them directly from their website! Use code “MINDFULLY20” to get 20% off your first month’s subscription! Washi is (usually) inexpensive. You get quite a bit in one roll, typically six to ten meters. It comes in all shapes, designs, and sizes. It sticks on nicely, but it’s easy to peel off if you don’t put it in the right place. The only downside to washi is, and I say this jokingly, that it’s very addicting to buy. I know a lot of people who buy a few rolls end up with huge collections in short amounts of time. Washi Tape is definitely more fun and decorative rather than practical. It’s also a perfect addition to any bullet journal spread. Washi is mostly for fun, but there are a few ways you can use it for practical purposes! 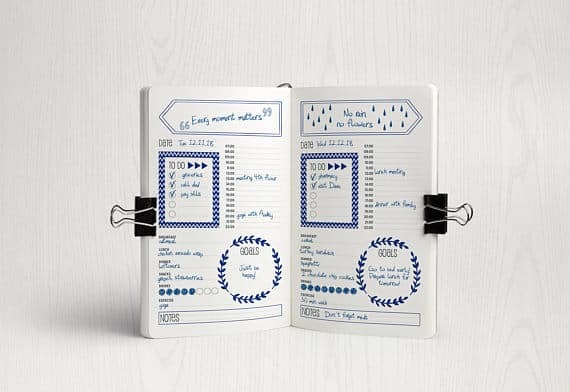 Page Labeling– A lot of people will cover the outer pages of the same month with one specific washi design. 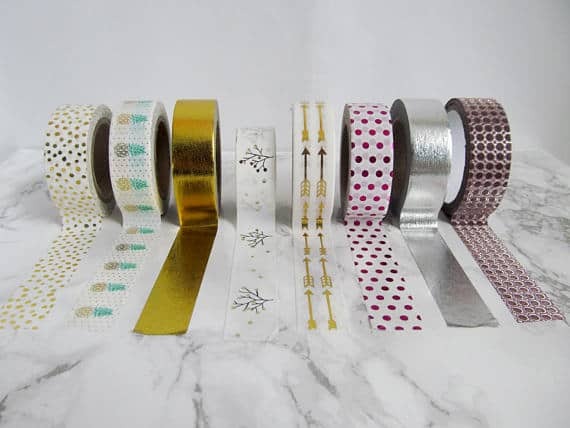 When the new month starts, they will use a different washi tape design. Great way to label your content easily. 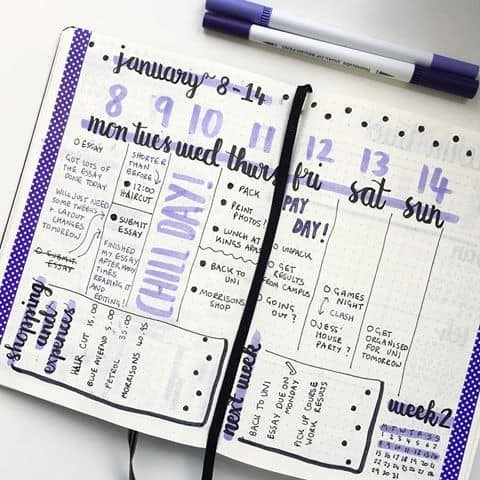 Hacks– There are a lot of great bullet journal decoration hacks that exist and you’d be surprised to know that washi is involved for many of them! 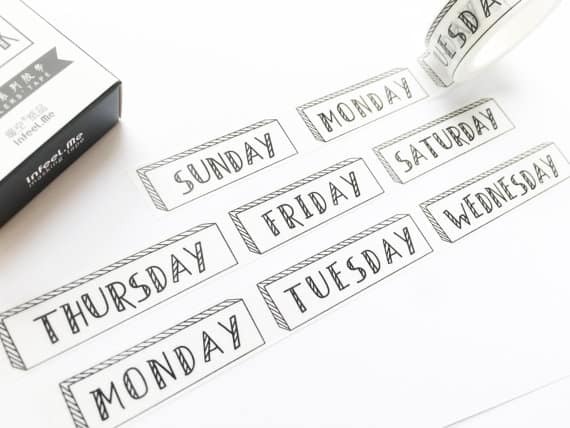 Use washi tape instead of writing out all the days of the week. 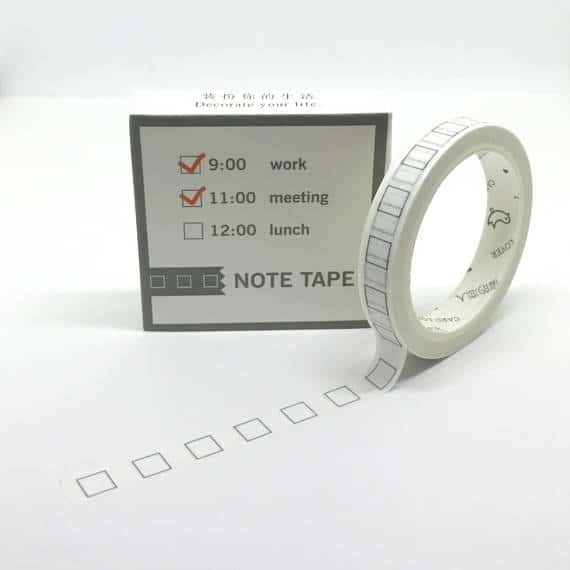 No need to make checkboxes anymore, this washi tape roll takes care of that detail for you. Despite all the interesting ways you can use washi tape for practical reasons, most people use washi tape to decorate bullet journal layouts. 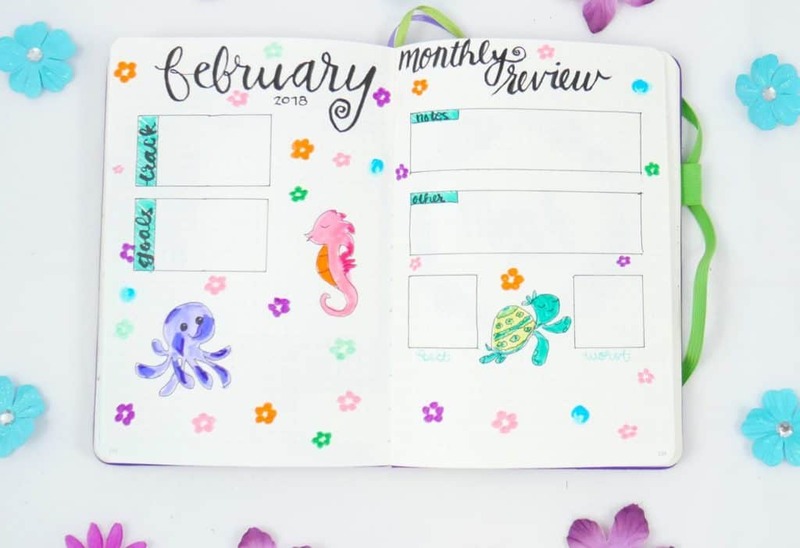 Here are some inventive spreads that use washi to brighten up a bullet journal spread! 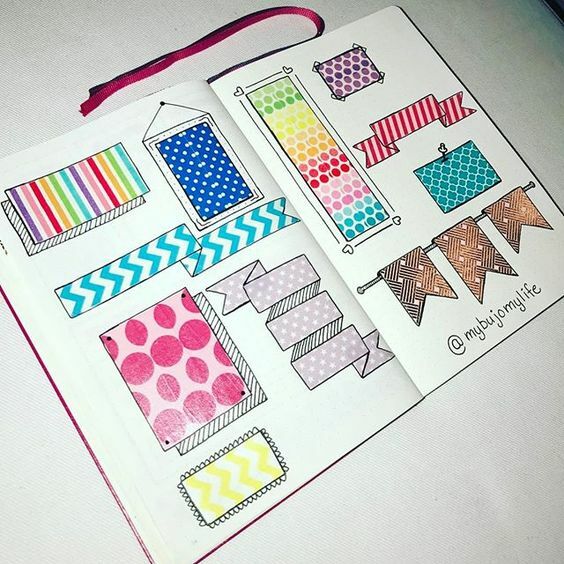 You can make a beautiful page to show off all the washi you own! Washi is a great border for any bullet journal layout! Need some help getting started finding options to choose from? Here are some awesome choices that you will love. Worth noting, if you aren’t sure on committing on full rolls of washi, tape samples are a great way to try different styles. 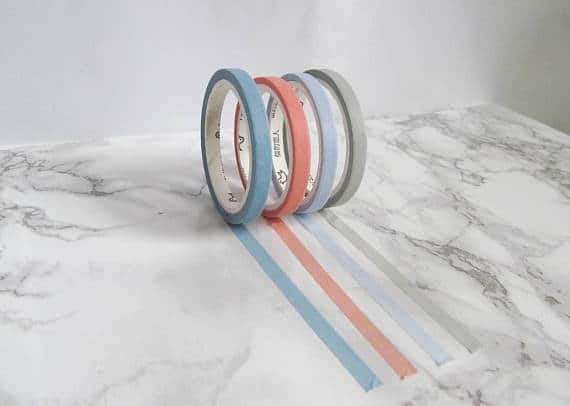 Often times you’ll get anywhere between 12 and 24 inches of washi tape to try out in a sample! Foil washi is absolutely beautiful and a great way to add a little glitz to any bullet journal spread! Another example of a washi tape sample option, thin washi is a great choice for borders and lining edges of pages. 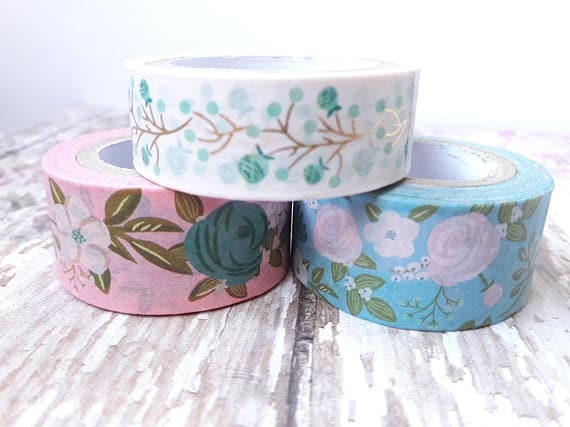 You can never go wrong with beautiful floral washi! 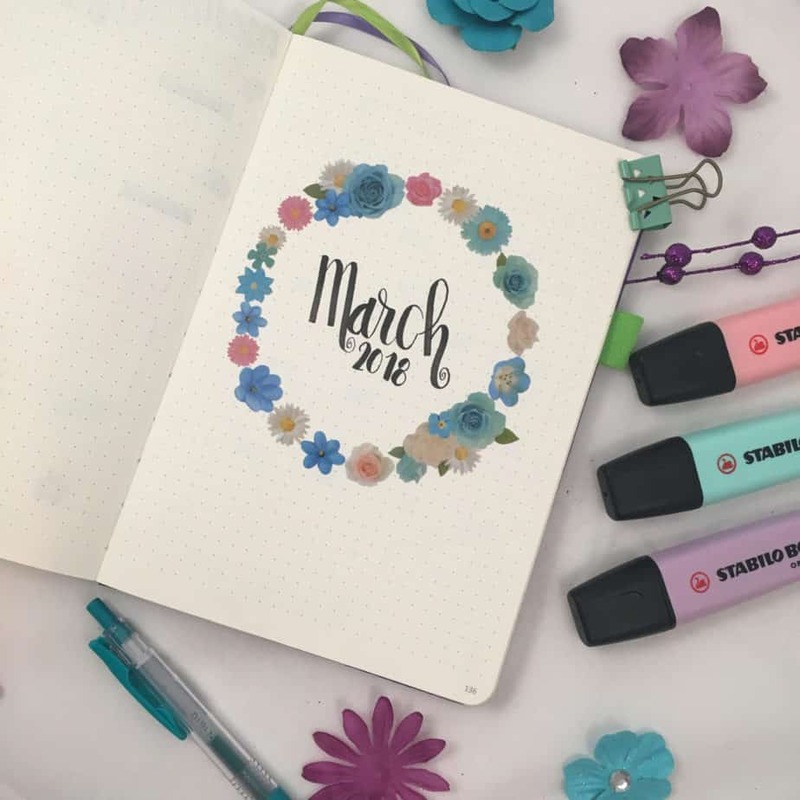 It would be perfect for any spring bullet journal spread! 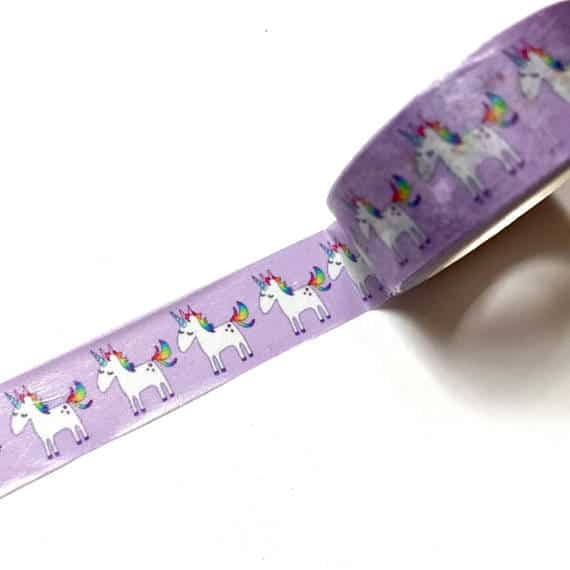 Absolutely love how funky this unicorn washi tape is! I’ll be honest, I haven’t tried stamps yet, but I know a lot of my friends in the bullet journal community are all about stamps. While stamps are an investment, they are wonderful because you can use them for other arts and crafts projects. There are some really great practical stamps perfect for the bullet journal artist. 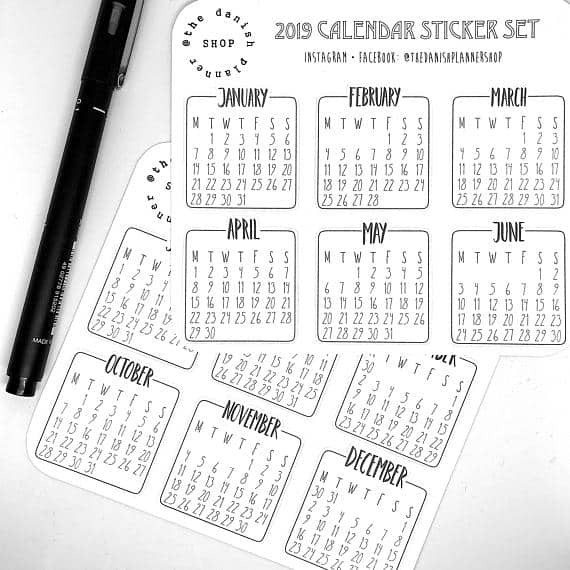 They have stamps for to-do lists, stamps for trackers, and even stamps for calendars! 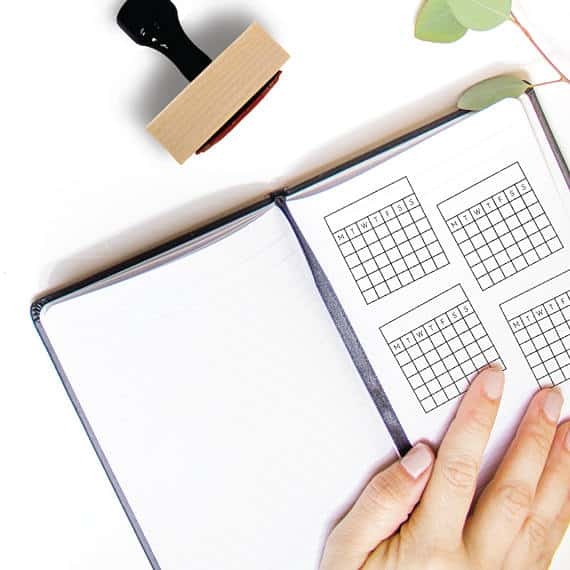 Save time and energy by stamping out your monthly goals. Additionally, they offer a ‘Sunday First’ option if you start the beginning of the week on Sunday instead of Monday. Simplify your to-do list by just stamping it out instead of drawing it. 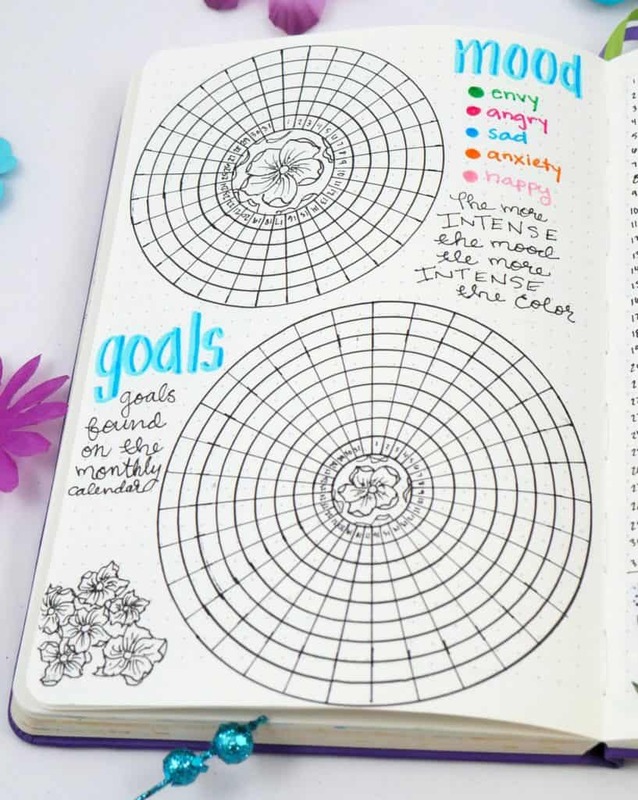 Want to draw a simple flower 100 times for the background of your bullet journal spread? Or would you rather stamp out a flower 100 times to decorate the background of your spread? Stamps are an easy way to add bullet journal decoration easily to any spread. Like drawing the doodles by hands, you can use different colors of ink for your stamps to provide some easy variety. Decorate your bullet journal spreads with beautiful plants while saving time not having to hand-draw every single one! Stencils are probably one of the few tools that I rely on more for practical reasons rather than ‘fun’ reasons, but that isn’t to say I use it for both! Stencils are more likely my practical solution to add ease and organization to any bullet journal spread. One of my favorite stencils for this purpose is this stencil from Moxiedori! It features a lot of different options on this one stencil to draw boxes, lines, and even make darkening dots on a dot grid easier. It’s quickly become a new favorite over my ruler and I carry it with me everywhere. The other neat feature is that this stencil is see-through, so you can visualize other lines and sections easily. I made this circle tracker with this Compass Protractor Stencil from the Etsy Shop “Moxiedori“. It’s so easy to use and makes really unique spreads. I like the circle format because I feel like you can condense a lot of information in a small space. 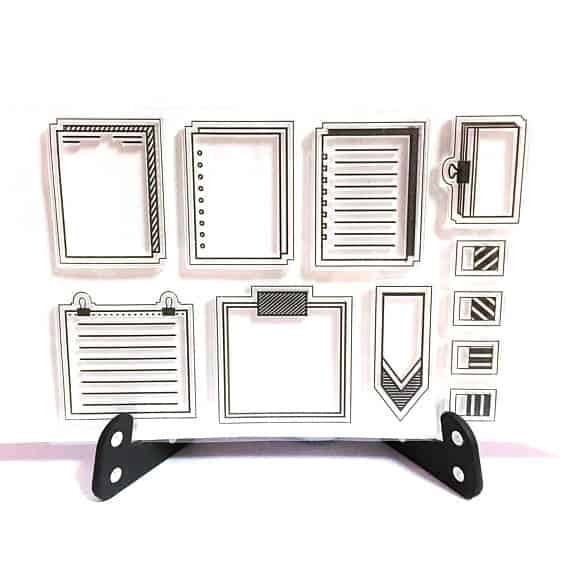 This awesome stencil starter kit is a great way to simplify your layouts with many different choices to use for decorations. Beyond boxes and borders, you can find a lot of fun stencils to help with lettering, doodles, mandalas, icons, and more. 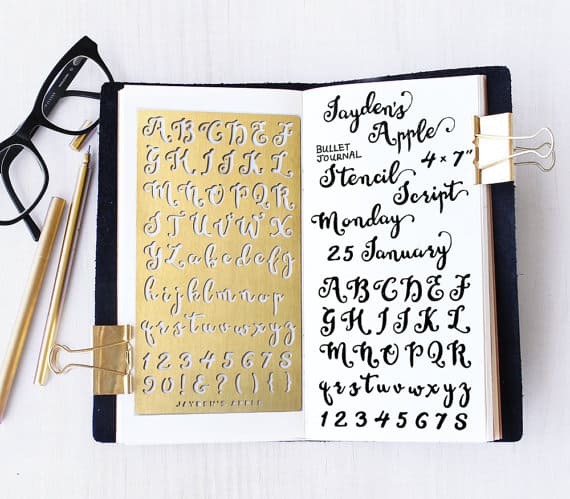 Beautiful lettering made easy with this adorable stencil. You even get numbers and symbols as an extra bonus. A beautiful stencil that includes many different elements such as icons, lines, and letters. 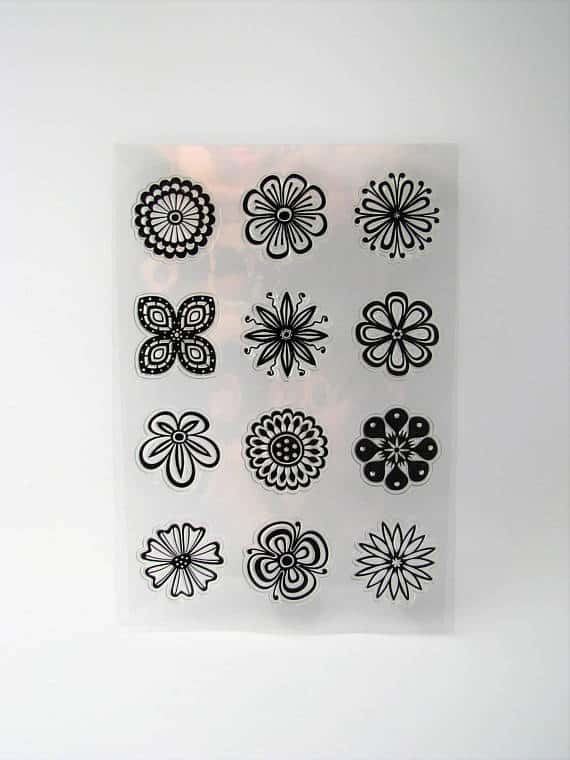 Let this stencil make drawing flowers easier and faster. 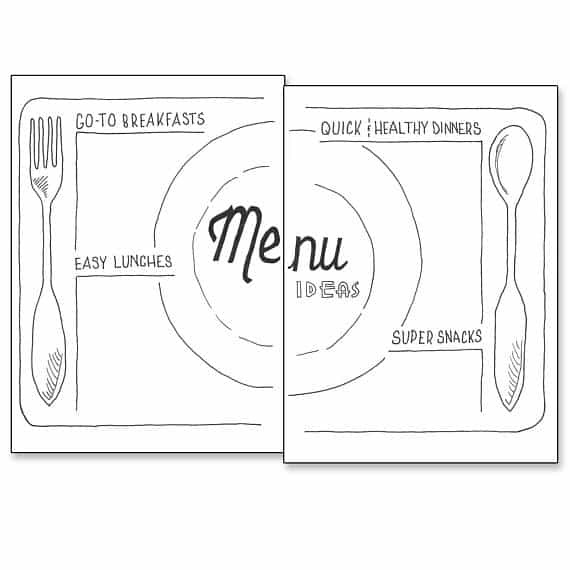 Printables are the even mix of both practical and fun. They are also super easy to use, probably more easy than any other method mentioned in this article. Many are free, and the rest are relatively inexpensive. If you have a printer, scissors, and double-sided tape, you already have the tools you need to make printables work. What’s especially unique about printables is that many of them create the entire structure of a page for you. It’s literally print and paste. They may be plain and efficient, or fun and complicated. There are flavors in every shape and form you can think of. The most wonderful part of practical printables is that it is such a serious time saver. You can draw a monthly tracker by hand (that takes me 45 minutes minimum), or you can print one out and paste one (that takes probably 20 minutes or less). 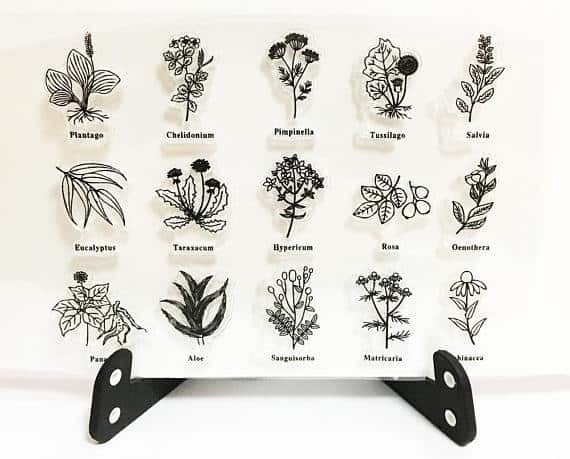 The most challenging part of using a printable in this case is finding the specific one you want to use because they truly have so many choices to pick from. 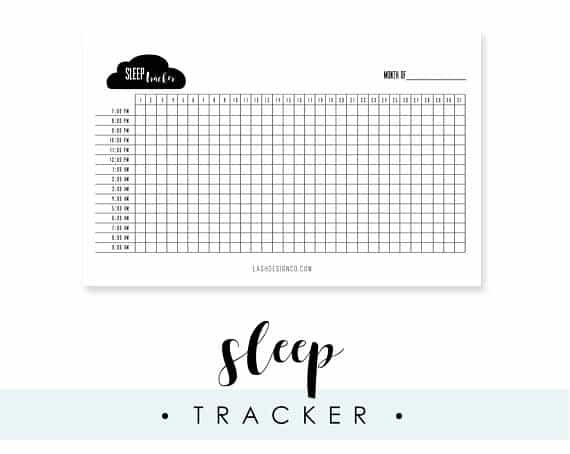 Save tons of time from drawing out every single grid with this easy and straightforward sleep tracker printable. Here are some other free printables to try out in your bullet journal that are practical! Entirely fun, such as a mandala printable, because goodness knows HOW challenging they can be to draw!!! 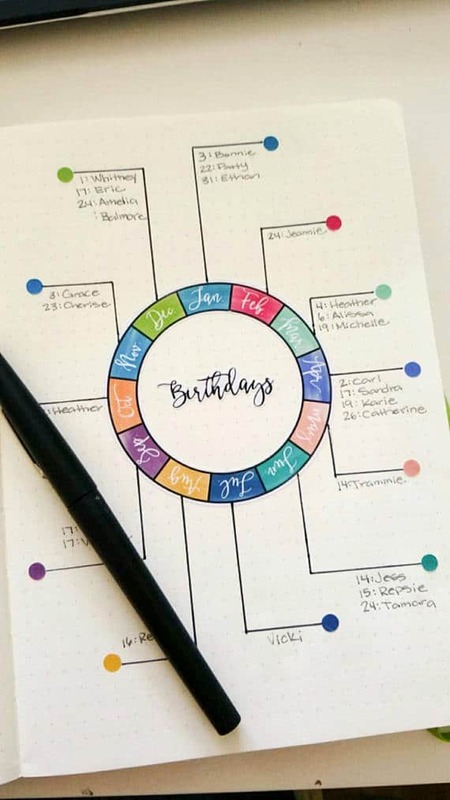 Save time by just printing them and coloring them in your bullet journal. Or, you can find some fun AND practical printables to use in your bullet journal! For instance, if you like the idea of making fancy lettering in your bullet journal, you can get hand lettering printables to improve your skill. I love how this printable adds some color and a nice flow for all the elements in the bullet journal spread. There is literally no shortage of free AND fun printables, especially with a quick Pinterest search! Here’s one I found for icons. Whether you decorate your bullet journal for fun, for practical reasons, or for both (I suspect the majority of you do both), these decoration tips all help you simplify your process and save you time and energy. Sure it may cost a little more money using additional tools to save you time… but since we can’t buy more time, this is the next best step. One of the best tools anybody can do for their time management is to learn to delegate the tasks they can. If spending $5 on stickers saves you two hours of drawing the same things by hand, isn’t that worth the expense? How do you decorate your own bullet journal that saves you time and sanity? What are your favorite products that make your life easier? 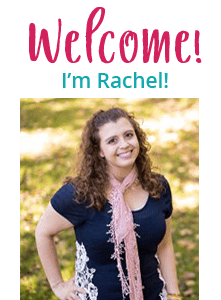 PS- Want to learn about some of my other favorite bullet journal tools that also make my life easier? Read about them in ‘7 Bullet Journal Tools for Beautiful Bujos‘! Did this post help simplify your bullet journal? Share it with others on Pinterest! Thank you for your feedback, Vicki!